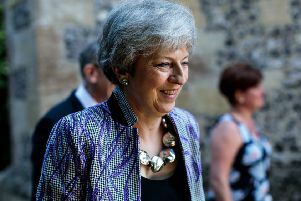 The Bayeux Tapestry could be put on display in Britain following reports French president Emmanuel Macron has agreed to allow the artwork to leave France for the first time in 950 years. The tapestry, nearly 70 metres (230ft) long, depicts the events leading up to the Norman conquest of England by William the Conqueror against his opponent Harold, Earl of Wessex, and culminates in the Battle of Hastings. According to The Times, Mr Macron is expected to announce the loan of the artwork when he meets Theresa May at Sandhurst on Thursday. The paper said the director of the Bayeux Museum in Normandy - where the tapestry is currently based - confirmed preparations were under way for the embroidery to be re-located, but said tests would need to be carried out to make sure it could be moved without being damaged. The location for the display in Britain is not thought to have been decided and it could take five years before it reaches British shores. The tapestry last left Normandy to be put on display in Paris in 1804 and briefly at the Louvre in 1944 before being returned to Bayeux. The French President will hold talks with the Prime Minister at the UK-France summit, which a spokesman said would highlight cross-Channel co-operation on issues such as climate change, air pollution, cyber threats and the human genome. Dr Alex Woolf, from the School of History at University of St Andrews, welcomed the news. He said: “The Bayeux Tapestry was stitched by Englishwomen within a few years of the Norman conquest at the behest of either Queen Edith, the widow of Edward the Confessor, or more likely, William the Conqueror’s brother Odo, Bishop of Bayeux, who had been made Earl of Kent after the Conquest. “It is far and away the largest and most famous example of English art surviving from the eleventh century and has been of unparalleled importance to historians and art historians of the period. Returning the Bayeux Tapestry to the UK could allow British historians to finally study the back of the work. It is understood that PM Theresa May will discuss loaning the tapestry to the UK when she meets French President Emmanuel Macron on Thursday. The 230ft long creation depicts events leading up to the Norman conquest of England by William the Conqueror against Harold, Earl of Wessex, and culminates in the Battle of Hastings. The famous arrow-in-the-eye scene apparently depicting the death of Harold at Hastings in 1066 is believed to have been added in Victorian times. Speaking on Good Morning Britain, scholar Maggie Kneen said until now, experts have only been provided with footage and photographs of the back of the piece. She said: “When you get to know it as I have been able to do you realise what a treasure house of information it is about what was going on at the time. Although called a tapestry, it is an embroidery stitched in nine different panels. The first record of the piece is in Bayeux Cathedral’s inventory of treasures in 1476, but it is believed it was stitched in England by nuns at St Augustine’s Abbey. “The stitching is as beautiful on the back as it is on the front,” Ms Kneen said. Levi Roach, medieval historian at the University of Exeter, said: “As Britain seeks to renegotiate its relationship with France, there could scarcely be a better symbol of the close yet fraught ties that have bound the two nations together. “Probably made in England for William the Conqueror’s half-brother Odo of Bayeux, the Bayeux Tapestry - or more accurately embroidery - depicts events from a Norman perspective, but with real sympathy for the fate of the English. The tapestry is currently on display in a darkened room in the Bayeux Museum in Normandy. Napoleon put it on display in Paris in 1804 and it was briefly exhibited at the city’s Louvre in 1944. The Times reported that tests would need to be carried out to make sure the tapestry could be moved without being damaged. The location for the display in Britain is not thought to have been decided, but staff at the British Museum are hopeful it might be chosen. Hartwig Fischer, director of the museum, said: “This would be a major loan, probably the most significant ever from France to the UK. “It is a gesture of extraordinary generosity and proof of the deep ties that link our countries. “The Bayeux Tapestry is of huge importance, as it recounts a crucial moment in British and French history, 1066. “We would be honoured and delighted to display it at the British Museum, the UK’s most visited and internationally respected institution.